Take That, the UK’s most successful live act ever, have confirmed that they are heading back out on the road in 2015. 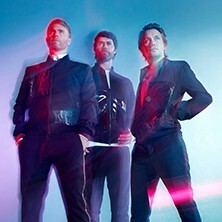 Next May will see Mark Owen, Gary Barlow and Howard Donald perform for 9 dates at the Manchester Phones 4 u arena. Time has flown by as it was in fact four years ago since the band’s last record-breaking tour Progress Live in Manchester. Limo Hire was was next on the agenda after the purchase of the concert tickets and as usual everyone had the same idea leaving a shortage of limousines over the North West. The Previous Manchester tours included everything from aerialists, circus performers, a wall of water, holograms, a giant elephant and on the last tour a 60ft robot (We were there ourselves to experience the performance). The band’s shows have never failed to excite and surprise their audience and next year’s are sure to be no exception, so now you have your tickets its time to think about your transport. Limo Hire to Manchester from Limos North West. Supporting Act for the duration of the tour will be Ella Henderson who recently celebrated both her debut single, ‘Glow’ and her first album, ‘Chapter One’, reaching the No.1 spot in the UK Charts, the gig is set to be a hit! Don’t delay, Book your limo asap.